Introduction: Subjected to relentless pain, lives contract and crumble. As in the days of Job, lonely on his dunghill, and of Philoctetes, marooned because of his foul-smelling wound and piercing cries, chronic pain today imprisons many in isolated torment. There, perhaps, the similarities between pain today and pain in ages past end, because historical epochs and cultures shape suffering in diverse ways. A social constructionist approach arguing that “culture `completes’ humans by explaining and interpreting the world, helping them to focus their attention or to ignore certain aspects of their environment, and instructing and forbidding them to think and act in certain ways” orients thought to these divergences. This approach has been applied to topics such as sexuality, pregnancy, depression and stress. Pain is not simply an oppressive given in experience, but also a response to oppression. Its sociogenesis has received attention. Studies of the cultural and historical expression of pain exist as do psychosocial investigations of pain. Morris surveys the wide field of pain’s meanings, concluding that in our day chronic pain, as it becomes more common, becomes paradoxically increasingly senseless because our social construction defines pain biomedically. There is an “existential crisis of meaning” of pain. To gain critical distance from and insight into chronic pain in the late twentieth century, I turn to the past. Central to my approach, a phenomenology of past experience, is attention to the exteriority of the past. The past cannot be understood through concepts imported there from our own understandings of ourselves. The past is other, foreign; it harbored different existences. The taken-for-granted world of the twelfth century radically differs from ours. Yet we can read and listen and learn. This approach is not whiggish, that is, does not assume our superiority, our progress, in any way. The twelfth century was a different reality. A study of pain in the twelfth century reveals pain to have been embedded in culture. Pain had sense as a natural, social, and spiritual experience. Depending on circumstances, it could manifest disharmony and imbalance in any of these three registers. Pain was unavoidable and something to be alleviated. The life of Aelred of Rievaulx (1110-1167), a British Cistercian monk who suffered greatly throughout much of his active life, provides an example of pain in twelfth-century monasticism. With contemporaries such as Bernard of Clairvaux, a driving force behind the Cistercian reform of monastic life, Aelred championed a renewed spiritual life in English society. 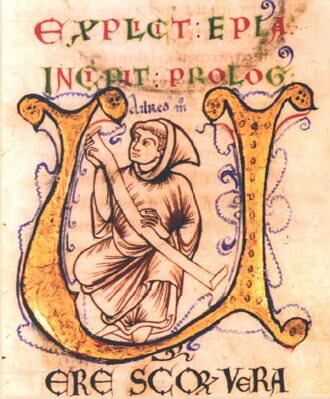 Aelred was a gifted writer, his works contributing to the formation of Cistercian spirituality. Moreover, they expressed a distinctively twelfth-century view of human life. In comparison with earlier spiritual writings, they show a more focused concern with psychology and a greater interest in the humanity of Christ. Aelred was learned in Latin literature and interested in human affairs for their own sake. Aelred’s experience is available because Walter Daniel, his close friend and fellow Cistercian, wrote a hagiographic biography of Aelred, paying detailed attention to Aelred’s suffering. Aelred’s writings and Walter’s Life of Ailred together afford a picture of pain in twelfth-century monastic life.